Today we have another guest article by Jonathan Bluestein. Enjoy. 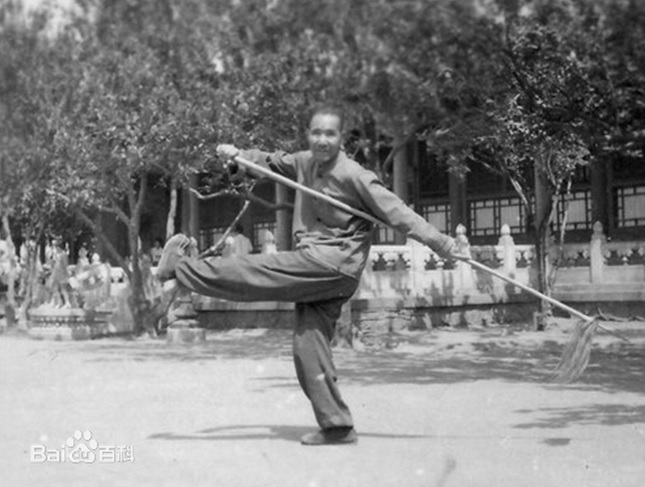 Among the many arts taught by late master Zhou Jingxuan was a style called ‘Shaolin Jingang Bashi’, or ‘The Eight Posture’s of Shaolin’s Buddha’s Guardian. This rare martial art, now almost lost, is an exquisite tradition that I have had the privilege to study in part from master Zhou. Here is the story behind it. The Shaolin Monastery as we know it today is a modern invention, sponsored by the Chinese Communist Party. The original temple, which existed for several centuries, was destroyed and later rebuilt several times. A focal point for martial arts traditions from its early days, the temple first became well known for its staff techniques and later for empty-handed martial arts. The monks, being Buddhist, hold to a faith that forbids violence. However, the circumstances of occasional visiting bandits, thieves and armies forced them to adapt their practice for survival. Following many years of civil unrest and internal conflicts in China, the location of the temple was nearly deserted in the 1970s and 80s, when the Chinese Government decided to invest in it and introduce many new monks to rejuvenate lost traditions. Yet the motivation was anything but religious. The place, now famous worldwide because of various books and films, was growing into a tourist attraction, and the government recognized its money-making potential. Thus, over the next few decades and to our present day, the Shaolin Temple gradually became the ‘martial arts Disneyland’ of China, with countless other competing ‘theme parks’ masquerading as ‘martial arts academies and schools’ popping up in the nearby mountains and valleys of Hebei and Shandong. These places now offer school-boarding conditions and sometimes even hotel-like accommodations for those souls searching for a self-made fantasy of being a Chinese warrior. Frankly, what is being taught is the athletic and sports-oriented modern wushu, with the traditional arts long forgotten. Fortunately for everyone, the original arts of Shaolin were not all lost. Throughout the centuries, once in a while a monk would leave the temple, a process that had been accelerated and multiplied whenever the temple’s population was under great duress. 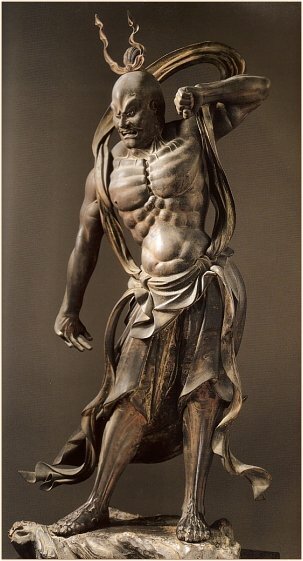 The monks, who spent a lifetime training in the martial arts, often did not neglect their practice, and taught what they knew to layman they met on their path. This is how the Shaolin arts spread far and wide. Back in the day, such arts were commodities of great use. They helped maintain people’s health in an age with less advances and not readily available medicine. Their practice aided in building strong bodies, and teaching independent farmers and villagers how to defend their territory from raids and enemies. Such valuable knowledge, people were willing to pay much for, or at least offer the teacher living arrangements to teach them. Then it so happened that a traveling Shaolin monks met with a local man from Tianjin city, whose name was Shi Yushan. This was likely in the early 20th century. The late Shi ended up learning a special martial art from the monk, whose name was lost to us – Shaolin Jingang Bashi (少林金剛八势). This art is no longer practiced at the Shaolin temple, although poor modern imitations of its most basic movements are occasionally demonstrated by some monks. These were likely copied from books or similar, and are not the original art. The art, it should be noted, was quite rare to begin with, because it had been an ‘inner-court style’ – a more advance level art, that was only taught to experienced monks. In fact, back in the day it did not even have a formal name. It was simply called ‘Nei Yuan Quan’ – ‘Inner Material’. Jingang (金剛), known as Vajrapani in Hindu, is the bodyguard of the Buddha. The original name in Hindu means (one with) Lightning in Hand. Jingang in the context of Shaolin and its religion is a combative war-mongering deity that is always portrayed with angry and intimidating expressions and postures, and is considered the protector of the temple. The statues of various Jingang are common sight in Buddhist temples throughout China. His very existence demonstrates well the departure of many Chinese Buddhists from their original pacifistic Indian origins, and their embracing of violence as means to an end under dire circumstances. The worship of the Jingang shows that the Chinese Buddhists who created its image were keen on receiving aid from a god of war – and for good reasons. 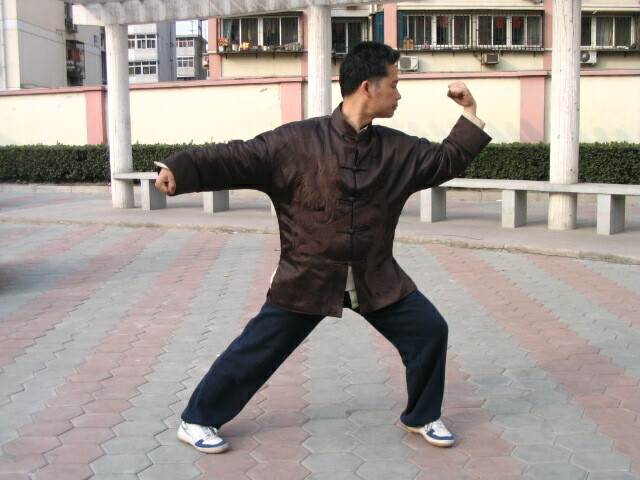 To this day, the imagery of the Jingang can be found in various Shaolin-derived martial arts – even Chen style Taiji Quan. After the art of Jingang Bashi ceased to be taught at the temple, it seems to have survived in only two lineages. Great master Li Ruidong (1851-1917), who created a very expansive system of Taiji Quan, have somehow managed to learn this art, and incorporated some of it into his Taiji. Sadly, in the process he also ceased to teach Jingang Bashi as a whole, and little of it survived in his line. 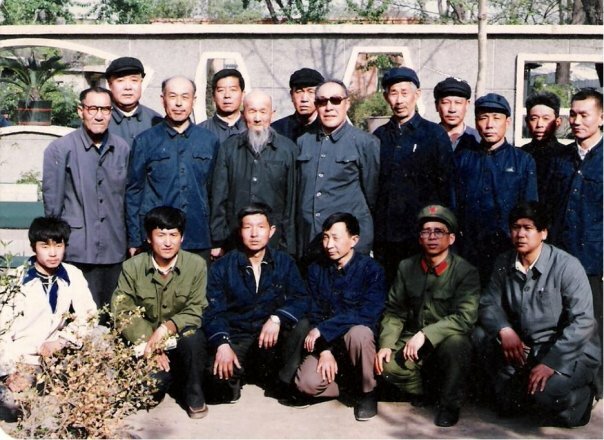 Shi Yushan, a contemporary of Li Ruidong, was the only one who managed to keep the art alive. In the picture: Master Tian Jinzhong, top disciple of Shi Yushan, with his spear. Following his years with the Shaolin monk, master Shi returned to his native city of Tianjin. There, he became famous, and known by the nickname ‘Iron Luohan’ (铁罗汉) for his ability to effortlessly absorb powerful strikes to his body at will. He subsequently became the manager of the ‘Tianjin’s 11th Chinese Martial Arts Academy’, a respectable institution intended to spread the arts publicly (a new social theme at the time). Tian also became a student of Wu Xiufeng, who is said by many to be the greatest teacher of Baji Quan to have lived during the 20th century, and whose art is considered a branch of its own: ‘Wu-style Baji Quan’. This art too, Tian learned fully. In his study of these two arts, master Tian saw many complementary elements. Jingang was very swift, agile, quick, flexible, unpredictable, light, crisp and mobile. Baji was very heavy, powerful, unified, unyielding, forceful, rooted, blunt and violent. By combining the strong points of both arts, master Tian was able to create a tradition that offered the best of both worlds. Although he maintained separate teachings of the two styles, each one of them had undergone renovations and innovations based on the unique skillsets of the other. Therefore, the successors of Tian Jinzhong, although their Baji came originally from Wu Xiufeng, refer to their art as ‘Tian style Baji Quan’ rather than ‘Wu style’. Here is the only surviving video we (outside of China) still have of master Tian, demonstrating the Qing Long Jian (Green Dragon Sword) of Jingang. It should be noted that the performance is somewhat casual, also omitting parts of the form, as Tian was not interested in sharing his knowledge completely with strangers (a typical traditional Chinese mindset). One of Tian’s gongfu brothers under Wu Xiufeng was master Zhao Fujiang (赵福江; - 2007). With a level of skill seldom seen even in China, master Zhao was able to create a new art, Yin-Yang Baji Quan, by combining his extensive knowledge of Baji Quan, Xing Yi Quan and Da Cheng Quan. Here is a very lengthy documentary about master Zhao. Those among you who do not understand Mandarin Chinese may feel free to skip to parts containing more action. Despite being recognized as a great master in his own right, who founded his own system of martial arts, Zhao Fujiang always admired and looked up to his older gongfu brother, Tian Jinzhong. He admitted to have never achieved Tian’s level of skill in the arts. Master Tian passed away age 74, in the year 1990. Through decades of teaching Tian too, like his teachers, became a famous figure in the city of Tianjin. His instruction was sought by many. Two lucky individuals were able to study master Tian’s complete arts: Shen Jiarui and Sun Zhenyao. Sworn gongfu brothers, they continued to teach their arts together for decades. Master Shen was known to be the more heavy and powerful, and master Sun as the more light and agile. Together, they made a great team. Alas, about a decade ago master Sun suffered a severe hip injury and could no longer train. Master Shen continues to teach, but is not retired, and is currently in his 70s. 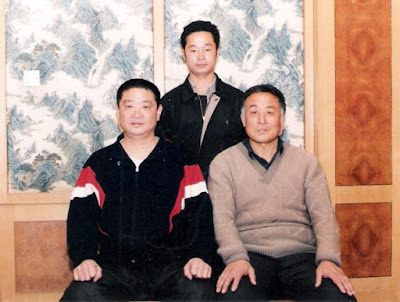 In the picture: Master Sun Zhenyao (left), master Shen Jiarui (right), and master Zhou (behind them). Image is from the early 2000s. Masters Sun and Shen were able to transmit their arts fully so far to only one student – their top disciple, late master Zhou Jingxuan. Sadly, Zhou shifu passed away this year, age 50, from medical complications of a stroke. Click here for a short biography of his life and teachings. Late master Zhou became the embodiment of Jingang Bashi, and was the last inheritor of this complete system. So skilled and knowledgeable was he, that his manifestation of the art combined the strengths of both his teachers. That would not be surprising given the many decades master Zhou had spent studying the arts with countless teachers. 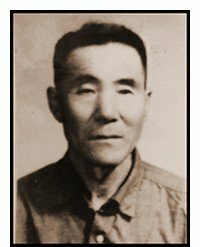 Moreover, he not only received in-depth private tuition from masters Shen and Sun, but was also corrected and taught at times by Tian Jinzhong himself, and was a long-term student of his gongfu brother, Zhao Fujiang, whom I mentioned before. With such profound instruction, it was only natural that Zhou shifu would with time achieve a high level of mastery in this art. Because most of my own exposure to the art had been through master Zhou, from now on in this articles, examples and anecdotes would mostly be directly based on his teachings, which his photographs and videos illuminating this wondrous cultural asset of China. In the picture: Various martial arts practitioners and teachers from Tianjin. Master Zhou is kneeling on the furthermost left corner. Right behind him with the glasses stands master Tian Jinzhong. The nearly bald man standing aside Tian is his gongfu brother, master Zhao Fujiang. Image is from the 1990s. As master Zhou’s fame grew far and wide, he gained access to studying and exchanging knowledge with many teachers. At one point in time, he developed an interest in Li style Taiji Quan. This system was developed by Li Ruidong (1851-1917), who practiced the Yang style Taiji of Yang Luchan and learned the entire Jingang Bashi system from an unknown teacher. Li incorporated much of Jingang into his broad, extensive martial arts system, but ceased to teach it as an art during his lifetime. Master Zhou located a group of dedicated teachers who practiced Li’s Taiji, and made an agreement with them – they would teach him their Taiji, and he would impart unto them all that he knows of Jingang Bashi. He was also accepted as an indoor disciple in that family under master Li Zhaoyin, student of master Li Ziqin (this was the seventh time Zhou had undergone such a ceremony and earned that kind of honour under a martial arts master). Zhou shifu managed to study most of their style, but how much they got from him remains unclear. This learning experience helped further hone his Jingang, adding the modified content taught by Li Ruidong, which was slightly different to what he had already studied with masters Shen, Sun, Tian and Zhao. Master Zhou was technically my grand-teacher, but most of my Pigua Zhang and some of my Xing Yi Quan I learned directly from him. The rest I studied with my main teacher, shifu Nitzan Oren, a fellow Israeli who is late master Zhou’s top disciple. They are both family to me. Shifu Nitzan studied with Zhou shifu on a daily basis for 7 years straight while he lived in the city of Tianjin. Indeed, since the days of Shi Yushan, all practitioners of this art were natives of that city. 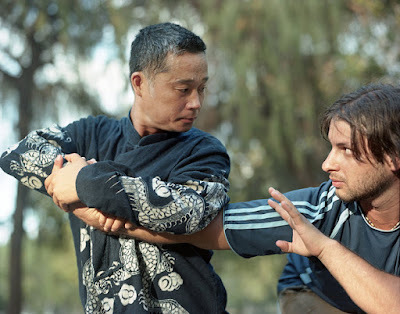 Initially, shifu Nitzan learned mostly Xing Yi Quan from master Zhou, who would on occasion supplement his studies with some Pigua Zhang, Baji Quan and the exploration of various weapons and their usage, as well as some Qi Gong practices (36 Methods Qi Gong, Ba Duan Jin, etc). After roughly 5 years of daily practice, master Zhou began to urge Nitzan to further and deepen his studies. He would often tell Nitzan that “he had nothing more to teach him as far as Xing Yi is concerned”, though unsurprisingly he would always have more methods, skills, techniques and corrections for him every week. 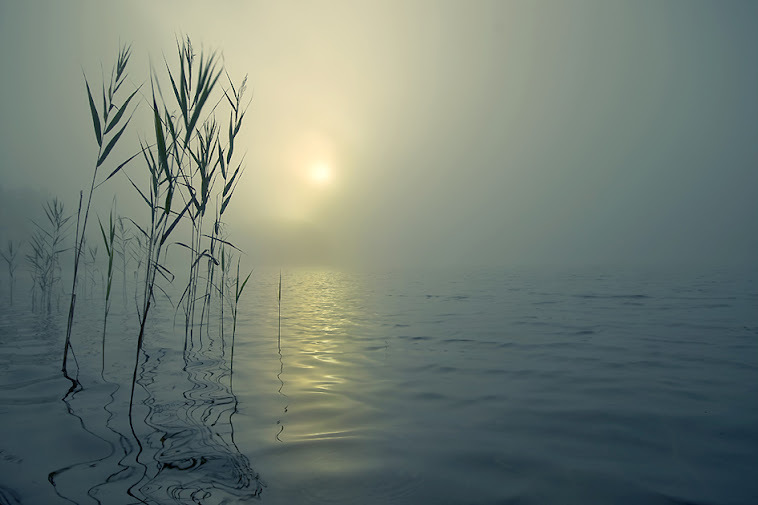 The truth was that the clever master Zhou knew all too well that in order for Nitzan’s gongfu to become greater, he needed to gain inspiration from new studies. This sent Nitzan on two new paths. Firstly, at Zhou’s recommendation, he found a new teacher to learn from, master Wu Bingwen, who taught Song style Xing Yi Quan. Secondly, at the same time and also with Zhou’s encouragement, he began to study Jingang Bashi. Thus, Song style Xing Yi and Jingang Bashi became the focal points of Nitzan’s study during his last two years in China. He would also continue to study Jingang Bashi from master Zhou after that time on occasion, returning to China and having Zhou visit and teach us here in Israel. This continued until master Zhou’s untimely passing. Luckily, Nitzan was able to learn most of master Zhou’s Jingang Bashi, and also document almost all that he had studied on video, with clear instructions and demonstrations by master Zhou on everything. I was also quite lucky and fortunate to have had the opportunity to study a little bit of Jingang directly from master Zhou. I was taught the eight basic combinations of the art, but also a very long segment of the highest, most sophisticated form of it, known as ‘Luohan Gong’. It remains an enigma as to why Zhou shifu chose to teach me that set of skills, which had never taught to anyone else; as even though I have been training in his arts for many years at that point, I had not practiced enough of this particular art to true appreciate and do justice to this long form. I suspect that Zhou was fearful that the art may become lost, and as he grew older sought to pass on as much of it as possible to whomever was willing to learn. Master Zhou and I were not close as friends because of the language barrier (my Mandarin is very basic), but we had a strong bond and understood each-other very well. I believe Zhou shifu always had faith in me, and in my ability to understand what he was trying to teach me. Thoughts of this almost bring tears to my eyes, as nowadays I am currently the only person actively and openly teaching his traditions (though shifu Nitzan will likely return to teaching in the future). This faith master Zhou had in me is a trust that I feel I cannot fail. I must live up to his high standards of excellence, and this article is a part of my genuine attempt to keep Zhou’s legacy alive and kicking. There has been some confusion over the origins of Jingang Bashi that should be addressed. Historican Kang Gewu suggested a relationship between Jingang Quan and Bagua Zhang. This is easily mistaken to be related to the subject of this article, both because of the name and also since Jingang Bashi uses the Bagua theory and the Yi Jing’s 64 hexagrams as a framework for the structure of its curriculum – much like Bauga Zhang. However, this is misguided. Jingang Bashi is not the same art as Jingang Quan, and these two are among several Chinese martial arts that use ‘Jingang’ in their name. Also, while Bagua Zhang very much a Daoist art, Jingang Bashi is fiercely Buddhist, both in its origins and in the way it is practiced. 1. The art is challenging to teach to beginners and assumes the practitioner already has some foundations built into his body through the practice of other styles. 2. The arts contains a truly vast arsenal of techniques and fighting methods, which provides ‘solutions’ to nearly any possible fighting scenario, with the sole exception of ground-fighting. In doing so, it can serve to fill-in technical gaps of knowledge in any martial artist’s arsenal. The curriculum of Jingang Bashi interestingly resembles in structure the way various styles of Bagua Zhang created theirs. The ‘Ba Shi’, or ‘Eight Postures’, refers to the art being segmented into many groups of 8 combinations. Once a set of 8 separate combinations is taught, the next can be studied, and each of these groups builds upon and evolves previous material. The art begins with the 64 Firm Hands (六十四硬手). First are taught the 8 most basic techniques, called Liu He Ba Shi – Six Harmony Eight Postures. 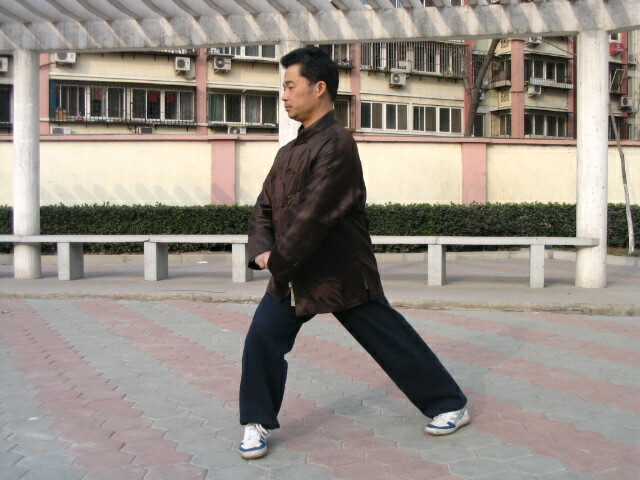 These techniques are the jibengong of the art, are less focused on actual fighting applications, and are meant to forcefully stretch one’s body to an extreme degree with very elongated postures. These are later evolved into the eight Jin Gang Ba Shi , which illustrate how the first hands can be used in combat. The cycle of the basic hands continues to amount until the practitioner has learned eight different groups of 8 combinations – or 64 movements and techniques total in this group called the 64 Firm Hands. At this point, all of the material is still made of standalone methods, without any forms to connect them. Each stage of learning is meant, as stated before, to be an evolution of the previous one, and the similarities between techniques in both external shape and principle makes them easier to study and memorize over time. 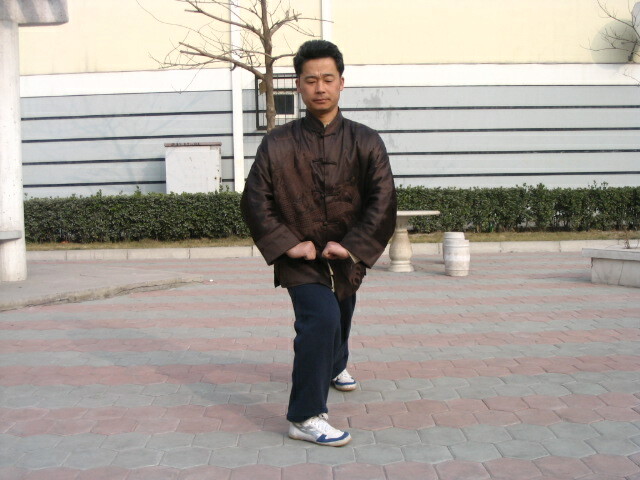 Master Zhou would also teach beginners special Zhan Zhuang (stand post) methods for this particular art. Although Zhou had extensively studied Xing Yi Quan (with no less than 4 teachers), the Zhan Zhuang he taught in his Jingang Bashi system were of independent origins, likely borrowing concepts and methods from ancient Qi Gong practices such as the Yi Jin Jing (Muscle-Tendon Classic 易筋經) and Si Xui Jing (Marrow-Cleansing Classic 洗髓经). The Zhan Zhuang of Jingang require more internal stretching and twisting than those of other arts, and are challenging to hold correctly, especially since distinctive breathing skills are involved. Often, as a prerequisite for Jingang’s more specialized Zhan Zhuang, master Zhou would also teach Xing Yi’s Hun Yuan Zhuang (Cheng Bao Zhuang) for a few months. Here are a few examples of the types of postures that would be taught (there are several others not shown here). Shown Zhuang are very basic. Once the Liu He Ba Shi are well drilled and the foundations of the style’s Zhan Zhuang are set, the 64 Hard Hands are taught. These are eight groups of eight combinations, which are very combat-oriented. With these, the experienced practitioner may notice that there are included in the art many techniques commonly found in Xing Yi Quan, Baji Quan, Pigua Zhang, Shuai Jiao, Fanzi Quan, Luohan Quan and other northern-Chinese styles. How this came to be is a mystery, since master Zhou did not make these up, and his Jingang teachers (and their teachers) did not practice Xing Yi or Pigua or any other arts apart from Jingang and Baji. Regardless, such similarities were a blessing for master Zhou, since he had studied several of the styles featuring comparable techniques before arriving at Jingang. This meant that to begin with, the art came very naturally to him, and he was able to transmit it with great depth. As the 64 hard ones become second-nature, the practitioner will make a transition into the practice of their more advanced form – the 64 Soft Hands. These are also segmented into 8 groups of 8 combinations. These are built as set reactions to fighting scenario attacking or responding to attacks, and anticipating various reactions, providing elaborate ‘solutions’ to any tactic the opponent may come up with. There is more stepping and kicking involved, and the footwork should be akin to that of dancer – very mobile and swift, light and agile, almost hopping around yet remaining grounded. Although the mechanics are very different, the rhythm is reminiscent of good Western Boxing. Here at this stage are also first introduced more refined body mechanics which are often similar to those seen in the Internally-oriented arts. The practitioner here seeks to begin development of the art’s trademark power, which has a very snappy quality to it, and is unique to this style. This power combines the whipping character of Tongbei and Pigua strikes with the forceful nature of Shaolin arts. Also shown with the 64 soft hands is the higher-level footwork, which is key for the application of the art in combat. Jingang likes to surround the opponent with rapid and unpredictable stepping patterns, which require much lightness and agility. This calls for physical dexterity and flexibility of mind, too. As a training aid in the mastery of the 64 hands’ intricate footwork, the practitioner will work on moving through the drawn path of a ‘magic square’. This type of drawing or diagram is known as the ‘Magic Square’ in Western culture, but has older roots in Chinese culture, going back many thousands of years to the famous Luo Shu 洛書 (ancient diagram; below on the left). This later became another notable Chinese symbol more similar in shape to the Western Magic Square, known as the Nine Palaces. The latter is used for the training of footwork in Bagua Zhang and several other Chinese martial arts as well, and is mentioned in Sun Lutang’s books. The purpose of this strange and counter-intuitive stepping pattern is to teach the body to be able to naturally transition around and into any obstruction and attack, being able to naturally evade and outmaneuver any threat. Sun Lutang wrote that a prolonged practice of this method has the capacity to “profoundly change the practitioner”. Some of the 64 soft hands have been combined into a form known as ‘Mian Zhang’ (Cotton Fist). The Northern Shaolin origins of the art are very apparent in this form, which features many commonplace Shaolin techniques and footwork patterns. It is the first long form to be taught, and is excellent for cardiovascular conditioning. The latter ability is important for the practice and use of the art, since it relies on much movement in space as part of its overall combat strategy. In fact, the art is no less mobile than Western Boxing, and its footwork is more complex, too. 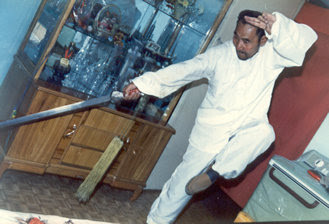 In Mian Zhang is first seen the Mandarin Duck Kick, which is also common in Chuo Jiao, Fanzi Quan and many other Northern-Chinese arts, and later appears in more advanced forms of Jingang as well (see second 35 in the video above). This kicks and many other movements as such require a great degree of flexibility. 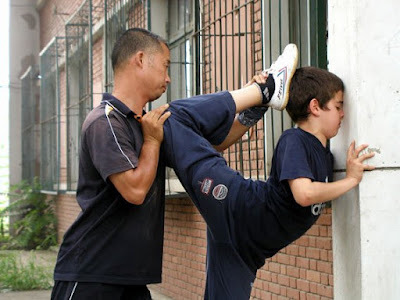 Below is an image of master Zhou training a child student to achieve that level of flexibility, which is key to learning many moves and methods. Interestingly enough, though many consider this to be an upward-driven kick, one aims to be hitting on the way down as well, which can result in a devastating chest blow. The practitioner who is already familiar with the 64 soft hands and the Mian Zhang form would be encouraged to combine the hands at will, creating elaborate and novel combinations without a fixed routine. This is essential for learning true fighting flow. Training will continue with learning the Lian Shou Quan (Linking Fist Hands). These are eight very short forms which are practiced explosively. The practitioner charges forwards in a straight line, executing the entire form with 10-12 steps and “in a single breath”. These linking forms add a strong anaerobic conditioning component to the training. Their purpose is to train one’s body and spirit to initiate and end a fight with a short, continuous streak of unstoppable action. One becomes like a string of firecrackers being lit and exploding in quick succession, issuing force and shaking hearts without letting one’s heart settle. The emphasis is also put on creating superior smoothness and transitioning from one technique to another. Next in line on the curriculum are two complementary forms: Qing Long Quan (Green Dragon Fist) and Hei Hu Quan (Black Tiger Fist). These advanced hand forms carriy the ultimate fighting flavor of the art and are highly regarded. While most of Jingang Bashi is practiced at a walking pace or very fast speeds, these forms are traditionally also practiced at slow and very slow speeds, and in a flowing manner akin to Taiji Quan. The Green Dragon (Qing Long) teaches flexibility of motion through the idea of attaining a ‘Dragon Body’, while Black Tiger yields through practice a heavy power that can be issued sideways. The Dragon and Tiger have long been considered completing opposites in Chinese culture. The Dragon is the god of the East, and relates to the Wood element, spreading wide with dexterity. The Tiger is called ‘Black’ (Dark) because of its vicious techniques, but is actually based on the White Tiger, the god of the West, associated with the Metal element, being heavy and sinking in nature. In our lineage, the two gongfu brothers Sun Zhenyao and Shen Jiarui represented these two animals in their personality and spirit. Sun the agile and quick was like a dragon and excelled with Qing Long Quan, while Shen the strong and heavy tiger is known for his Hei Hu Quan. Once the Green Dragon and Black Tiger forms are mastered, weapons must be introduced before the final stage of training is achieved. The weapons of Jingang Bashi, the Spear, Dao, Guan Dao and Jian (in this order), are essential not only for their own sake, but also for the development of superior shen fa (body method). Each of the weapons has its own dedicated long form, but is first taught through separate exercises and drills. Each weapon also teaches a specific set of battlefield concepts. For instance, the Jingang Dao is unique in that often one hand holds unto the back of the blade, and the weapon is then used somewhat like a staff. Another video of the Jian, by late master Tian Jinzhong, is included earlier in this article. The Jian of Jingang utilizes the tassel to practical training purposes. With various methods and techniques, the movement of the tassel and the place where it lands relative to one’s body, are used as indicators of precision in body alignment and timing. In Jingang the tassel is therefore actually quite useful for these reasons, though in other arts it is mistakenly thought of and used as an ornamental piece. The art culminates with an amazing form called ‘Luohan Gong’. This form is comprised of no less than 18 sections, containing 8 movements each (144 movements total). The walking pattern of the form has the practitioner advancing forward doing one section, then turning around in half a circle and continuing with the other section, and so forth. This walks the practitioner around drawing a very long snake-like path, which interestingly ends at a position quite far from the origin point. Rather than being a unilaterally balanced form that goes in all directions and end up where one began, the form has different training goals in mind. It assumes that those other attributes just mentioned should already be ingrained in the practitioner from the practice of other forms and methods over the years. This form now serves to catalogue the entire art in a single stream of techniques. Furthermore, the form is practiced very slowly, with little explosive power, unless a section of it is drilled independently. The focus shifts to advanced breathing methods, and the practice turns very internal and Taiji-like. Great softness is encouraged, and the form flows without interruption or stoppage. Much of the shen fa from the weapons is now incorporated into the hand methods, which together with newly-taught nei gong and breathing gains a whole new feel and perspective. The art then transcends its initial focus on technical prowess, and transitions into a practice driven by movement principles. Standing postures intended for developing structure and working on some of the Nei Gong of the system. The art of Shaolin Jingang Bashi is a treasure of Chinese culture, the work of many generations perfected into a superb fighting system. In it is contained a knowledge from countless styles and an experience based on a lifetime of exploring them. My heart aches thinking that this amazing martial art is now almost extinct. I have hope for the future though, as the art remains safe in the body and mind of my teacher, Nitzan, who is worthy of its keeping. May we live to see many excellent practitioner come to learn this special art from him, so it could continue to benefit future generations. Very nice post, It is very interesting to read, i gain lots of idea regarding Martial Arts. Thank you for share. keep it up. "Stiff" hands!? ... I am not sure if that is the right wording. You are right. 'Stiff Hands' is not the most appropriate term. The Chinese character for these hands can mean 'stiff' too, but in this context the word 'firm' is more suitable. I will soon make that correction.